As we all know, Rotary must continuously evolve so that we may continue to attract new members, retain current ones, and come together to do good in the world. With this in mind, I am excited to announce the formation of the Provisional District 6330 Passport Club! Passport Clubs are a new format of Rotary Club where members meet only a few times a year, instead conducting club business electronically. In lieu of weekly meetings, members are encouraged to engage in humanitarian service in whatever capacity works best for them! 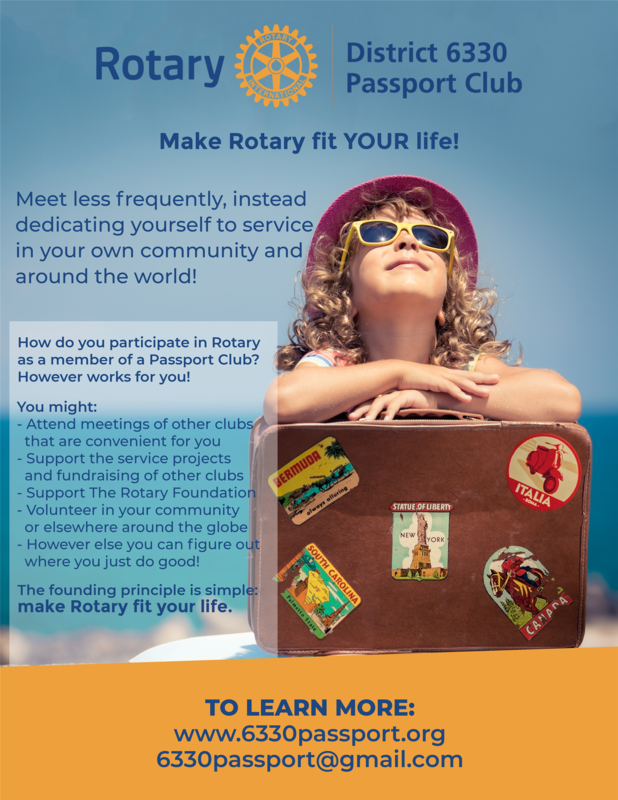 The founding principle is simple: make Rotary fit your life! This is an exciting opportunity for former Rotarians who are ready to return, Rotaractors, Alumni, and anyone else who does not find that a traditional club fits their life. For more information, and to stay tuned to what this new, provisional club is up to- visit the website and follow them on Facebook at the links below.